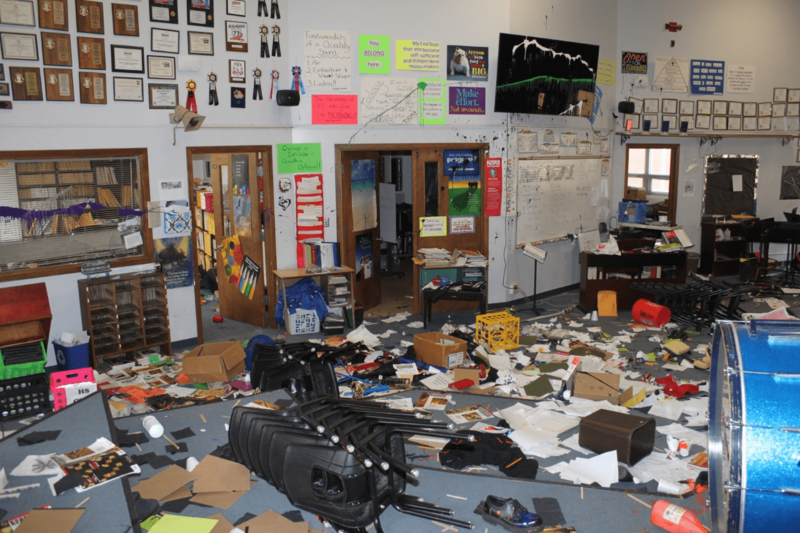 UPDATE: Pretty Prairie school officials now say four students have been identified as the ones responsible for a weekend vandalism that left the high school band room with extensive damage. The students have not been identified and they have been suspended. The school district was waiting on a damage assessment before deciding on how to clean up and repair the damage. Reno County sheriff’s captain Steve Lutz said the four students were interviewed and some stolen property has been recovered. He said information will be presented to the Reno County district attorney’s office for a decision on charges. The Reno County Sheriff’s Office is investigating vandalism that left extensive damage to a band room at Pretty Prairie High School. The vandalism was discovered Saturday morning when the principal was giving a school tour. Reno County sheriff’s captain Steve Lutz said in a press release that the vandalism happened sometime between 1 a.m. and 3 a.m. Saturday. Several different colors of paint were thrown across the floor, walls and over equipment. Most of the drums had holes punched in the, and some musical instruments were completely destroyed. Fire extinguishers were also discharged on the building in a van recently purchased by the school. It’s also believed that some items were stolen from the school. Damage was estimated between $50,000 and $75,000, but it could end up being higher. Anyone with information is urged to contact the Reno County Sheriff’s Office at 620-694-2735 or Crime Stoppers of Reno County at 1-800-222-TIPS (8477). The school district is accepting donations of music equipment or other materials. If you want to help, you can contact the Pretty Prairie Schools main office at 620-459-6241.